The USPC is one of the few championships that follows the World Puzzle Federation’s model of puzzle balance including observational puzzles, word manipulation puzzles, and often some “trick” puzzles alongside a mix of classic constraint satisfaction types and variants. I figured — given existing contributors — that I would be most called upon to make some innovative word and observational puzzles alongside some original (read: previously unseen) variants that would hold new surprises for all solvers. 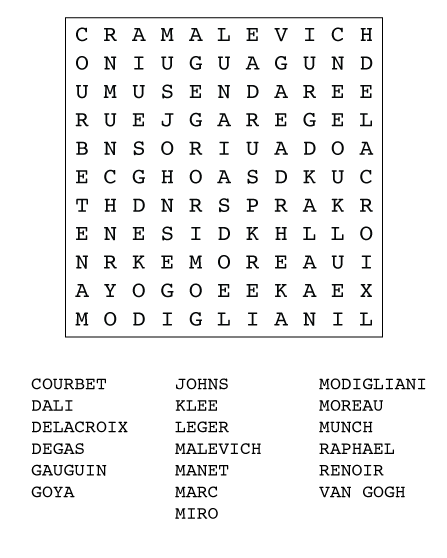 The first puzzle I wanted to highlight is one that is meant to be recognizable and friendly to even the casual solver: the USPC Word Search. 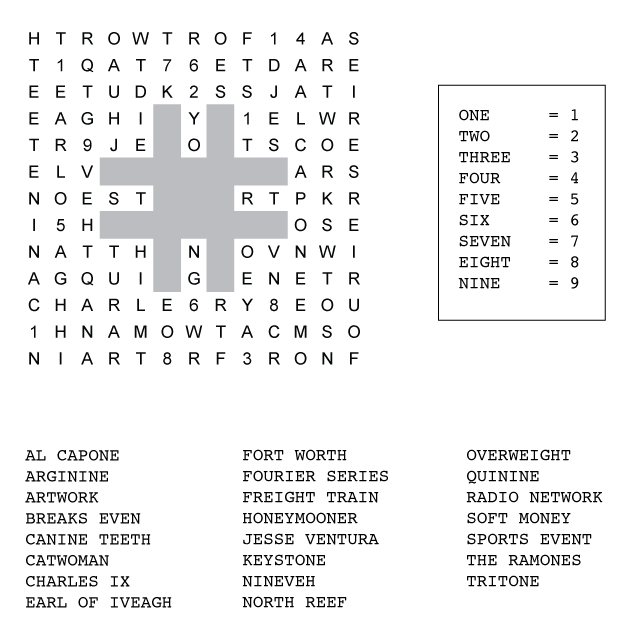 I had a few ideas in mind this year for creating an interesting word search, and settled on a variety rebus gimmick where entries may or may not contain a shortened set of characters in a single square. Having previously used digit word phrases for a Sudoku Masterpieces puzzle (Some Err1ous Spelling!) and having much of that research on hand, I took my time getting a good interlinked set of “Digi2rds” together for the USPC puzzle. The missing middle shaped like an octothorpe was another goal I had in mind to give the puzzle some character. I also laid some traps around the middle for solvers trying to intuit words too soon. While many solvers will turn their noses up at a word search, I still see great value in having such puzzle styles represented on a puzzle championship. I hope I managed to give an intriguing challenge with the puzzle below. Rules: Standard Word Search rules. Also, a digit may be used in place of its letters when spelled out. For example, “DIGIT WORD SEARCH” might appear in the grid as “DIGI2RDSEARCH”. 25 characters are missing from the grid and must be identified to complete the puzzle. Answer String: For the USPC, the answer string was the 25 missing characters in order. For this week, you can just hit the solved button on an honor system if you think you’ve solved it. Rules: Standard Word Search rules. Answer String: Enter the final message, related to what you are getting today, revealed by solving the puzzle. Enter the answer in all capital letters, with no spaces or punctuation.